The Greater Manchester Sound Archive is the new collection of sounds at Archives+ , Central Library in Manchester. It is a rich sonic treasure trove charting the socio-political history of the city with oral histories, music and nature recordings to name but a few. I was asked to create a soundscape and work with the LGBT archive for the LGBT Voices live event at Manchester Central Library. The aim was to raise awareness of the archives by undertaking some outreach workshops, I ran a soundart project with young people at the Proud Trust where we used contact mics to unearth and record the hidden sounds of the youth centre. We also put out an open call for spoken word artists to respond to the LGBT oral history archives, these responses were performed live at the event. We also had a submission from Reform Radio who had created a podcast with their young trainees. Over the past couple of months I have had the priviledge to listen to over 60 of the oral history archives. As well as learning so much about the history of gay rights in the city and lots of different LGBT narratives and topics including Polari, Section 28, how Manchester City Council was the first to invest in a gay centre for it citizens and political perspectives on spaces for subcultures to exist. I was interested in the ‘sounds of recording’, the pops, clicks and false starts that happen when conducting oral history interviews. These small incidental moments were of interest sonically as I constructed loops and rhythmic patterns out of these. As well as referencing the oral history archives I wanted to showcase some of the wider sounds in the archives that I was particularly drawn to. The Jodrell Bank space tapes were really exciting, I was able to digitise these from tape cassette so I could work with the material. These included sounds from the sputnik satellite, moon echoes and an interesting lecture called ‘The centre of immensities’. Other textures I worked with were the industrial mill sounds, orchestrating the sounds of an Arkwright machine, spinning jenny, mill hooter on a drum pad, creating beats from the machinery of Manchester’s past. The Paul Graney archive was also fascinating and I sampled some of his world music recordings from his catalogue of radio show archives. I look forward to using more archive sounds as a source of musical inspiration, the act of sampling, manipulating and creating something new out of the historical material and combining this with new field recordings was truely special. It;s got me thinking of a new musique concrete performance I might like to try with old formats at the library. Thanks to Dave Govier at Archives+ for all his support, knowledge and enthusiasm whilst working on the project. Playing synthesizers and providing visuals in Central Library at the final performance of the ECHOTRACE project. Really proud to have been a part of this project, working with the Owl Project at Withington library animating the spaces with noises. You can see my visuals ‘fragments rewind’ and a show reel of other arty imagery behind the performers. 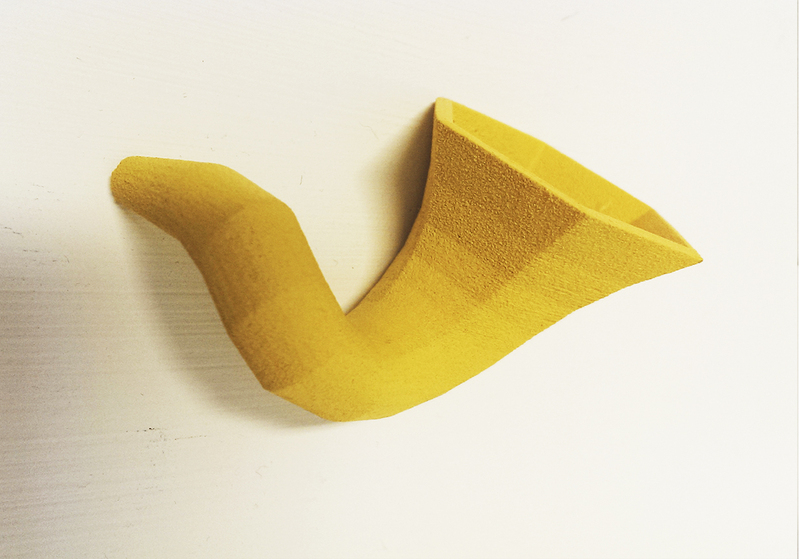 Reading about acoustic radar and defunkt hearing instruments inspired me to create a 2015 hearing trumpet. 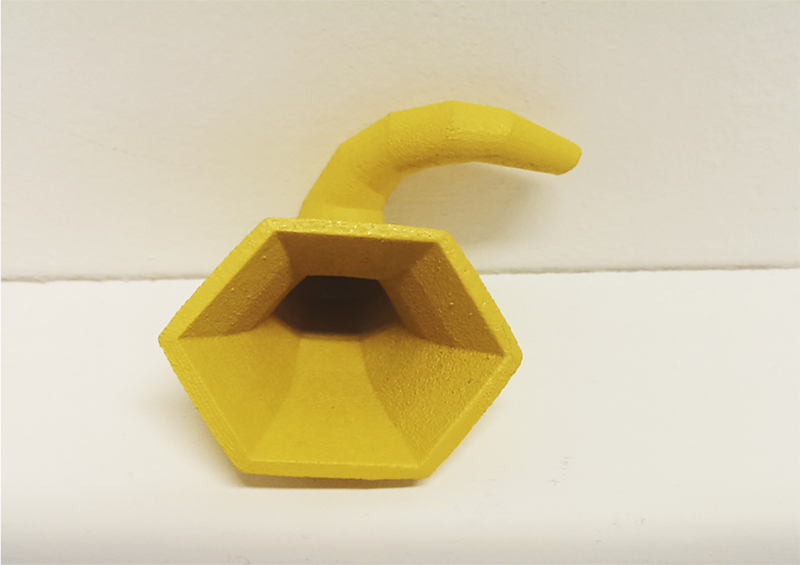 This piece was 3d printed and is actually hollow all the way through, it is quite mini so is good to amplify small noises. Using my sketchbook to document forms and shapes on my recent research trips to the National Media Museum and the Communications Gallery at MOSI has become a means to generate sculpural ideas in metal. The forms on this piece are all taken from objects to do with transmission and broadcasting which I made into paper stencils so I could rearrange and test out the interplay of the shapes and how they might balance. I’m also thinking of these in sheet metal and how these would sound on impact. 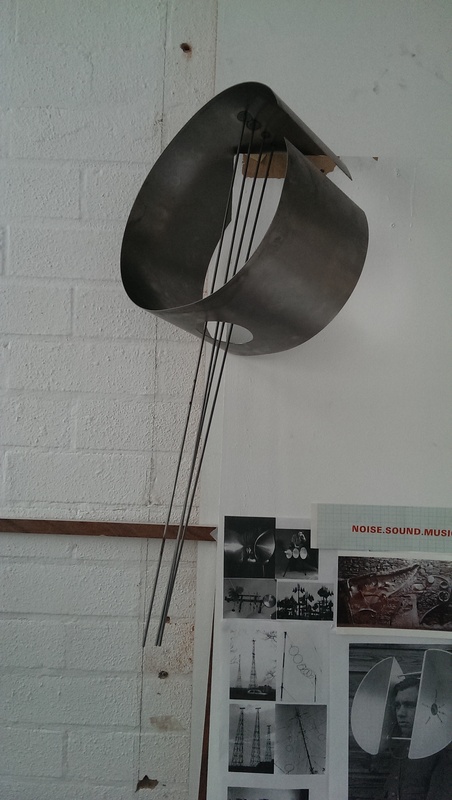 Metal work forays this week, i’m getting to grips with the equipment and processes of bending, cutting, welding and working towards developing a series of sound sculptures. 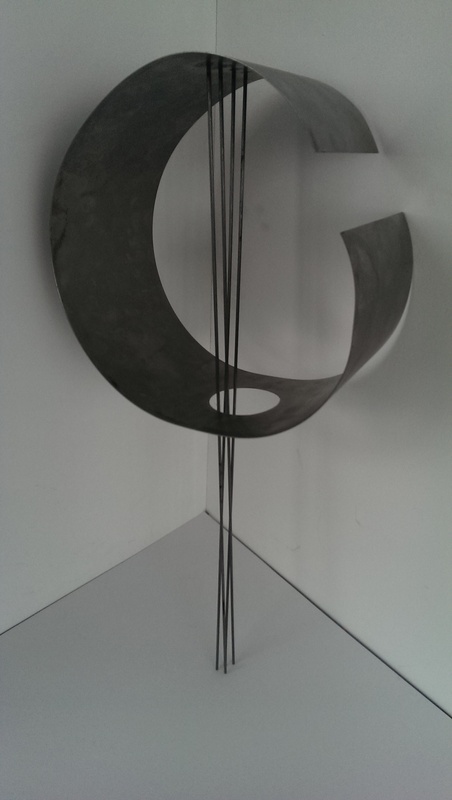 Steel on this scale is quite resonant, the 3mm metal rods descending through the sound whole activate the sphere. Next stage is to start to mic these up with contact microphones and begin recording and think about methods of suspension.